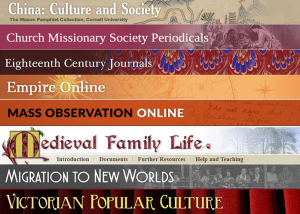 Working on your dissertation and looking for primary source material? Looking to incorporate digitised primary sources into your teaching? Wanting to expand your research with digital resources? Or just have no idea what primary source material might be available to you at the Library? The Library’s very first Discovery Day, on Tuesday 30th January, may be exactly what you are looking for. We invite you to the 1st floor, Main Library on Tuesday 30th Jan between 10am-3pm where representatives from 3 of the major publishers of digitised primary source collections, Adam Matthew, Gale Cengage and ProQuest, and our very own Centre for Research Collections (CRC), will be on hand to help students and staff navigate through and find useful material in the huge range of primary sources we have access to online at the Library. Staff from the CRC will also be on hand to help you find and navigate the University’s own extensive digital and physical primary source material. Between the 3 publishers the Library has access to over 60 digital primary source collections (make that over 300 if you count the fact that some databases, like Archives Unbound, are made up of lots of individual databases and collections), giving you access to millions of pages and images of digitised primary source material at your fingers tips. So why not come along and find out more about the wealth of digitised primary source material available to you at the Library. Who knows what discoveries you might make? Primary sources can include diaries, correspondence, historical and legal documents, eyewitness accounts, newspaper and magazine articles, statistical data, speeches, audio and video recordings, art objects, etc. You can register your interest in attending the event, however, this isn’t necessary. Do feel free to just drop-in on the day. 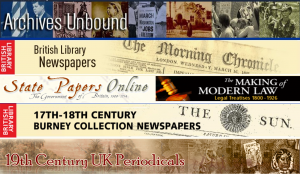 You can access all our primary source databases from the Primary Source, Newspapers & Magazines, Images & Moving Images lists or the Databases A-Z list. The Library has access to more primary source databases than just those available through the 3 publishers who will be at the Discovery Day, so it is worth looking to see all the resources available. Access is only available to current students and members of staff at the University. This entry was posted in Library, Online resource, Primary sources and tagged 16th century, 17th century, 18th century, 19th century, 20th century, archives, Asia, books, Britain, correspondence, cultural history, Databases, Discovery Day, E-books, Europe, First World War, History, International Relations, journals, Letters, magazines, Manuscripts, Medieval, newspapers, periodicals, Politics, primary source, social history, United States, World War Two by cstirling. Bookmark the permalink.